A root canal is something that sounds painful and has always come with the preconception of being a painful procedure, but it is not something that should be feared, as the patients of our dentist in Berwick have learnt. In fact, the procedure can be very painless due to local and/or general anaesthetic. The root canal – other than being the name of the procedure ­– is also actually a canal located in the centre of the tooth, which contains pulp. If decay occurs in your tooth, then the pulp can become infected and cause severe pain. This is when it may be a good time to get in touch with your friendly, local dentist in Berwick for a further look. The infection is first removed, and unwanted bacteria and dead/dying nerve tissue is cleaned out. 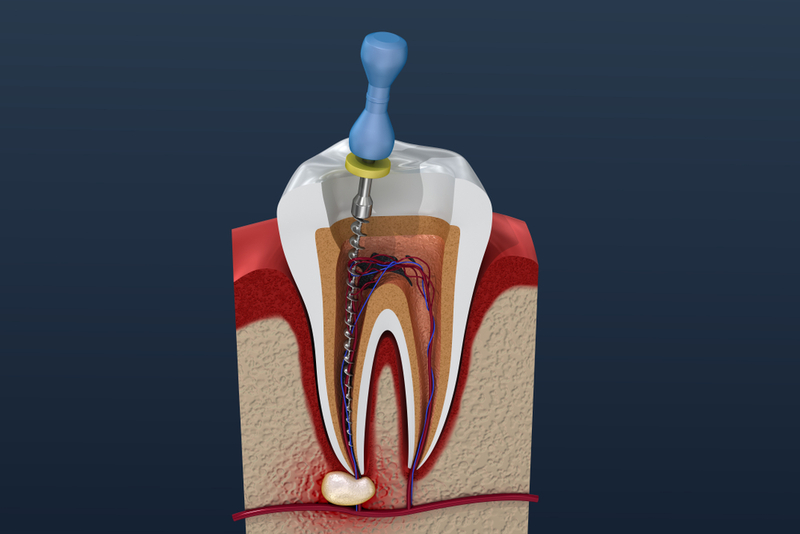 This is performed by drilling a small hole at the top of the infected tooth, allowing the dentist to access the infected pulp. The canal is then filed down and shaped so that it can be filled. The canal is filled with a long-lasting, rubber-like substance named gutta-percha, that will harden and protect your canal from any other unwanted bacteria or infection in the future. For further protection and strengthening, a crown is placed over the newly repaired tooth. The material of the crown can vary depending on how much shape the tooth has lost from the infection. This is usually done during a follow-up appointment. After the procedure is completed you will feel some pain in your tooth as the anaesthetic begins to wear off. Over-the-counter pain-relief medication is recommended to help deal with the pain, though your medical professional can prescribe something stronger if necessary. It is recommended that you refrain from chewing on the side of your recovering tooth and stay away from hot foods until your dentist tells you otherwise. It is also important to continue to brush and floss as you normally would during the recovery stage. It might not be easy at first to know if you’re in need of a root canal procedure. You may brush off the initial tooth ache as something that will go away in the next few days. But if it starts to become very painful to eat, or your gums begins to swell then there’s a chance the pulp inside your tooth may have become infected. When the pulp inside your tooth becomes infected, your tooth will begin to decay. If left unchecked, infected pulp could lead to an abscessed tooth. As a trusted dentist in Berwick, we’re more than happy to facilitate all your needs when it comes to a root canal procedure and dealing with such an infection, however the best thing for your teeth is avoiding that stage altogether. Brushing twice daily is an easy – and routinely – way to ensure healthy teeth. Keeping away from hard foods such as candy and ice as they could fracture and damage your teeth. Stay away (or at least cut down consumption) from soft drinks and other acidic beverages as they break down the outer layer of enamel on your teeth over time. This leaves your teeth open to harmful bacteria. Unfortunately, there are no alternatives that come close to the effectiveness of a root canal, unless the tooth is extracted. This is not a recommended procedure, however, when the option for saving your original, natural tooth is perfectly viable and safe – especially when the success rate is quite high. At the end of the day, a root canal procedure is best possible option available. Not only is it a generally harmless procedure, but it also allows you to retain your natural teeth. If you feel like you’re suffering from similar symptoms – painful tooth ache, swollen gums, jaw ache – and are looking for a dentist in Berwick, then contact Eden Rise Dental today. We will happily walk you through any concerns and calm any worries you may have as well as answer any questions or queries about the procedure. Get in touch with us at (03) 9702 6111 to book an appointment today.